Honorable folks at the Mushroom Kingdom! How be thee? Excited out of your wits for some Sunshine, no doubt. Since I'm so geared up to play Mario's latest adventure, I decided to go retro and I revisit Super Mario All-Stars to relive the good ol' days of the NES. A period in gaming when Mario still had sequels to a revolutionary title within the time-span of the console of the moment. Not only that, but the style of the cartridge is considerably different than the other version. But why state the facts when I can merely show you? rarer version. Notice the difference. I lucked out and won the "rare" version for $3.24 (plus shipping and handling of course). It hasn't arrived yet. 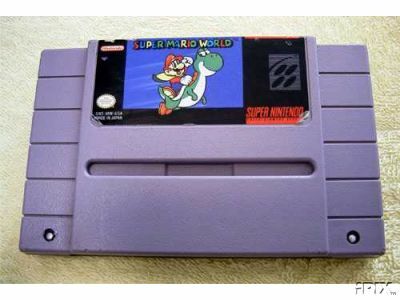 Which brings me to my question: why were there two different versions of Super Mario World, even if it only was on the outside? Was it for mere cosmetic purposes? Or did the newer verision have something the other didn't? David Dayton: I could be wrong, but I'd imagine the "rare" version of SMW is the rerelease of it. 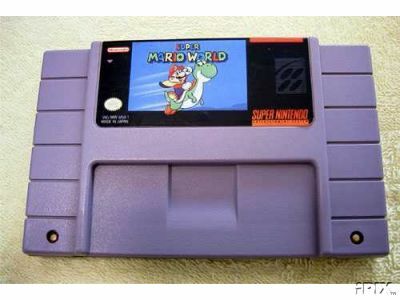 When Nintendo starting selling SNES systems without Super Mario World packed in, they starting selling it individually. That's about my only guess. As far as the picture goes, I really don't understand what I am looking at that is supposed to be a trick. Could you explain it? Also, in the same mailbag, Nario asks about Scott Joplin influence in Mario music. Well, I don't know about Joplin, but I do know that Nintendo often uses classical music in their games. For example, the music for Bean Valley in SMRPG and the music from Baby Bowser's castle place (which is entitled "The Dance of the Sugar Plum Fairy") are both by Tchaikovsky and are from the ballet, The Nutcracker. David Dayton: Um, I could be mistaken, but I don't recall any of The Nutcracker being present in SMRPG or Yoshi's Island. In fact, I just went back and listened to Bean Valley... it is not from the Nutcracker, from what I recall. For that matter, after more searching, I can't find anything in any game that even vaguely resembles The Dance of the Sugar Plum Fairy. Feel free to grab the MIDI file of the track from VGmusic.com and send it in so I can compare. And for the rest... Deezer, do you know anything about those files? Deezer: I still have them. I tried to put this in the message board but i couldent so im sending a email. But anyways! In Zelda 3: A link to the Past i found a boy in a house whos sick. If you talk to him he will guve you a bug catcher net.Then if you look in the back of the room theres a portrait of what im preety sure to be Mario! Hi! Nice site! I'm a newcomer here, but so far I only have one comment. Yoshi Story is a game I have wanted for years. Before I got it, it quit selling. I can't find it in Pawn Shops or anything. But I'm gonna continue to hunt until they day I die for that game. I Love Yoshi!! He's so cute and the game is so cool! (I know cause my step sister has it). But anyway, you do need to make a Fan Fic section. I am a good story and poem writer. Also, there is this cool site I found while surfing the web. It's called: Lemmy's Land . It has tons of stories and many of them are hilarious!!!!!! That's all I wanted to say. No questions. P.S. If you want an example of a poem just email me! My stories aren't finished yet, but I can give you an interesting part of it. - Dancing Cat, a feminine & furry Nintendo fan!! David Dayton: Try eBay for Yoshi's Story. There have been rumors of a GBA port, so that might make things easier. Feel free to send your poem in. More fan fiction? Hmm... Deezer, you wanna do something about this? Deezer: Unfortunately fan fiction is not one of my top priorities right now. I was reading the Tips and Tricks section on Super Mario 64 and one trick that really caught my eye was the M is for... trick. I believe that I have a reasonable explanation as to why this trick works. I have a Gameshark for N64 and I was using a cheat code that allows me to see the debugging screen the programmers used in the testing of SM64. 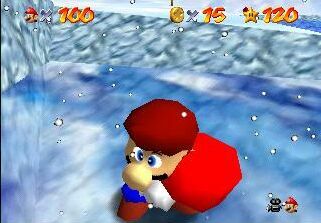 It displays the system memory, the system buffer, Mario's stance, Mario's angle, and most importantly, his speed. I noticed that when Mario bumped into something and bounced back, his speed would be something like "M5" or "M12". I realized that it ment he was doing backwards with a speed of 5 or 12, in other words moving at a speed of -5 or -12. Could M actually be the games version of a negative sign?! Until I saw these debugging statistics, I assumed that the "M" in the lives ment a very large number of lives, but that didn't explain the gaining a life when you die. Now I realize that the "M" actually symbolizes a very small number. I think that, seeing as you gain lives as you gain more and more coins, the game resets the number of lives once it reaches it's max. But, due to some glitch in the programming, the system resets it to, say, negative 25... Otherwise known as "minus 25". Or, perhaps, "M25"? David Dayton: Interesting theory. That might make sense. I haven't fooled with it enough to be sure, but it sounds reasonable. Deezer: I like the way Chris thinks. First: I would like you to know your site is the best site on the net. I go to this one more than nintendo's website! Second: Which emulator for the NES do you think is better(if you use them)NESticle or NESter? i couldn't figure the NESticle so I went with NESter. And third: if i send in a Mario comic, that is like one from the comic books, will it be put under fanart or fan fiction(if you use it)? P.S. I still havent gotten a reply fro Nintendo! Lets see, thats 4 months to the date!!! Deezer is faster than Nintendo! David Dayton: I don't use emulators myself, but I've heard good things of NESter and LoopyNES. Nesticle is a bit outdated. Mario comic submissions would, in theory, end up wherever Deezer feels like putting them... but, well, it is Deezer we're talking about, so just seeing it arrive should be good enough. Heh. David Dayton: No thank you. David Dayton: I have some of those too. Nowadays, I'd go to eBay and do a search for either Yoshi plush or Yoshi beanie. What source did you get the Sonic Adventure 3 information from? I have yet to hear this rumor myself. I'd appreciate it that you'd post a URL to a website that discusses this rumor, even if you're unsure that it is a trustworthy source. David Dayton: Folks, just a note. I don't keep old messages and e-mail addresses once I use them in the mailbag. I can't send messages for you to any particular person, because I don't have the e-mail addresses anymore. If, for some odd reason, you want me to list your e-mail address with your post, let me know in the mail. 1. Why are PAL games usually, if not always (? ), released later than the U.S. versions? 2. What exactly does PAL stand for? PART TBSHEPPARD 1. I really like Tbsheppard's review of the Super Mario Bros. Super Show! DVD (Mailbag, Aug. 26th). People should submit quality, bad-grammar-free reviews like that more often. 2. David, Deezer, J.J., M.B., I am going to type my e-mail address so that Tbsheppard can find it if he happens to read the Mailbag (so PLEASE DO include this in the Mailbag). I have tried all that I could think of to contact Tbsheppard, and nothing worked (I e-mailed Deezer, who didn't have his address, and put up a post in the Fungi Forums, which got no replies). He said he's looking for Super Mario Compact Disco, and I can help him with that, which I why I want to contact him. Here's my address: sputuf@hotmail.com. I already get tons of spam at that address, so I don't care who sees it. David Dayton: PAL games are released later because they need to be converted to PAL format for the televisions. Japan and America use the same television format, so converting a program is little more than translation. PAL tv's are so different that sometimes extensive reprogramming is required to get the game to work correctly. Whats the only other way of getting the Super Mario Brothers soundtrack? And i have a suggestion i think you shoulld put the soundtracks songs on for download at your site. Well thanks. David Dayton: Er, you can listen to the soundtrack in the games, or you can try to import one from Japan (good luck). If we put all the soundtracks up for download, a little thing called "intellectual property theft" occurs and Deezer gets fined. He might not like it. He'd have to go to jail and live with a guy named Spike. hello my name is clinton hey and i just brought out my super nintendo from somewhere in my basement. i have been obsessed with beating every mario game i can get my hands on. The first two were not a problem but i have been battling with the dark world fortress for about two months now. nintendo.com wasnt worth the temp file it took up on my computer when it came to being helpful. thank you very much for finalling allowing my girlfriend and myself some sleep. David Dayton: You are very welcome. If you want to show your gratitude, please wrap your girlfriend up in plain brown paper and mail her to 32- OUCH OUCH OUCH ACK Stop hitting me! I was looking through your site, and noticed a level editor section. Just for kicks, yeah? I have all I'd want, but hey. Anyway, I noticed that Lunar Magic, an awesome (the only) Super Mario World level editor, was missing. You really should put it there, ya know? Just so people know about it. Deezer: I keep forgetting about this, too. David Dayton: Mario beat Cloud --and-- Crono. As of now, the final round will be Mario vs. either Link or some wimpy from the FF series named Seph-something. Anyway, I have 2 questions. 1. I need the lyrics for Super Mario Land by the Ammbasadors of Funk. Are you going to help me in my long and dangerous quest to find them? 2. What brand of batteries would you recommend for Game Boy Advance? P.S. Be glad I didn't record an MP3 of me singing that tune. I almost did. Deezer: You know, you could've just linked to the page that has the lyrics. 2. Anyone know the reason why Luigi wasn't in SM64? 3. What happened to the Mushroom Boy? 4. With the last Mailbag that the Mushroom Boy answered in, someone asked where the secret page in TMK was. The Mushroom Boy posted a link, but it didn't work for me. Was it like that on purpose? 5. By the way, with this secret page, is it an actual page with secret info, or this one forum that I found? I had to ask because one of the replies in the forum I found was "could this be...the secret forum?" Mushroom Boy: Luigi wasn't in SM64 because he was too busy scouting writers for his big solo game. Sadly, the project got delayed for a few years, but it did come out eventually. Oh... and that link works fine for me and everyone else. You trust me, right? David Dayton: I don't care what Luigi said... don't trust the fungus. David Dayton: I've been waiting and waiting, and I haven't seen that toy anywhere. Joyride doesn't return my e-mails, and their parent company Ertl seems to have no clue. I just wanted to tell you, can you please add Daisy and Waluigi to the Character Profiles? Can you add more imformation to the characters? David Dayton: I was wondering the same thing. After all, Daisy and Waluigi have been in Mario Tennis, Mario Party 3, Mario Party 4, and Daisy has been in Super Mario Land. Both were trophies in Super Smash Bros. Melee. Of course, they really haven't been major Mario characters yet. That could be the holdup. I will admit that more info should be added at some point. hi, I would like you guys to answer a few questions. 1.Can you please give me a little hint where the secret page is? 2.Does the secret page have secret stuff about Mario on it? 3. Why is the mailbag always late? David Dayton: 1) Somewhere on this website. 2) I don't know. 3) It seems that no one does it anymore except me. 1. Do You know where i can Find Screenshots of Modern Boxing Classic/Modern Mario's Cement Factory and Classic/Modern Fire Attack in GWG4. 2. Is it likely that Popeye, Mickey Mouse and Snoopy Tennis (All Game and Watch Models) may be in Game and Watch Gallery 5. David Dayton: News on Game & Watch Gallery 4 is extremely limited. I can't really say much more than that. Hopefully more will be revealed as the game gets closer to launch. on the mario kart 64 page there is a screenshot that shows a speedometer on the screen. what part of the game has a spdmtr. or is it like a japanese version...? David Dayton: It appears to be Luigi Raceway. If I remember correctly, you can chance the map overlay to a speedometer at any point in the game by pressing one of the C buttons. David Dayton: I want those toys. Yes, send in a picture, please... and I'm fairly sure we have that cameo listed somewhere. You Deezer! This website is SOOOOO helpful! Anyway, I've been havin' loads of trouble gettin' through Level 6 of Yoshi's Island (The Maze Level). I've been wandering through that retarded stage for about two years now!!! PLEEEEEEEEEEEEEEEEEEEEEEEEEASE help me! in the new september issue of electronic gaming monthly (theres a zombie on the front)they have a very little pic of smrpg for the gba! (so it says)aw shucks ill just give u the paragraph! "lots of newbits this month my friends first on the docket is a gba version of the square/nintendo 16 bit collabo smrpg!" cool huh! well keep up the good site! David Dayton: Yeah, I've heard that rumor. Nothing substantial to back it up yet, but it could happen. I was reading through the bugs/glitches, and saw the thing on "Mole Mario." If you don't mind, I'll explain this. The reason for this is that there is an object down there to make that bright green pattern at the bottom of the screen. It merely lets Mario in front of it because it is considered non-solid in the game. Things'll fall right through it. It also overlaps the hills in the game because of it's position and because of when it was added (after the hills, appearently). Therefore, Mario can fly through it. Nice site, just wanted to supply some information. Now I don't care if you make fun of me for sending this, go ahead. Nice place to be! David Dayton: Yep, that makes sense. Deezer: I always thought it looked like a passageway underneath the hills. David Dayton: Er, not sure I understand. Deezer: Having the exact same website on a different server. David Dayton: Er, we are all over the place. The Princess coins are just there to allow you to collect them again. I am Ujima, Amethyst Princess of Maltitia. I have seen your site and I'm very impressed. I was hoping I would Find a certain game to download from www.Kazaa.com but to my surprise, they did not have it. Mario's Time Machine (SNES) was not in their download file. I was shocked. out of all of the games I have on the computer, Mario's Time Machine is my favorite. I'm glad I see it once again on your site, yet I feel so upset that I couldn't find it. I had to tell this to someone So I chose you. David Dayton: You can always buy a copy. You might find one on eBay. I won't even ask about the Princess part. I have a question. Isn't the SSBM stage Rainbow Cruise a mario course in SM64? Then why not include? Also, why is the Eggplant Man(trophy) Mario-related? David Dayton: Yes, it is. It should be included. Eggplant Man is a character from the game Wrecking Crew for the NES, which starred Mario. Deezer: Rainbow Cruise is included now. Last minute inclusion: For those of you who have Animal Crossing already, David is desperately seeking the NES game items for it. Name: David. Town: Daytonia. If you would be so kind as to send all your NES games there, and then drop him an e-mail, he would surely appreciate it.